There is no mistaking that it is time for a party with this design in mostly bright & happy primary colors! 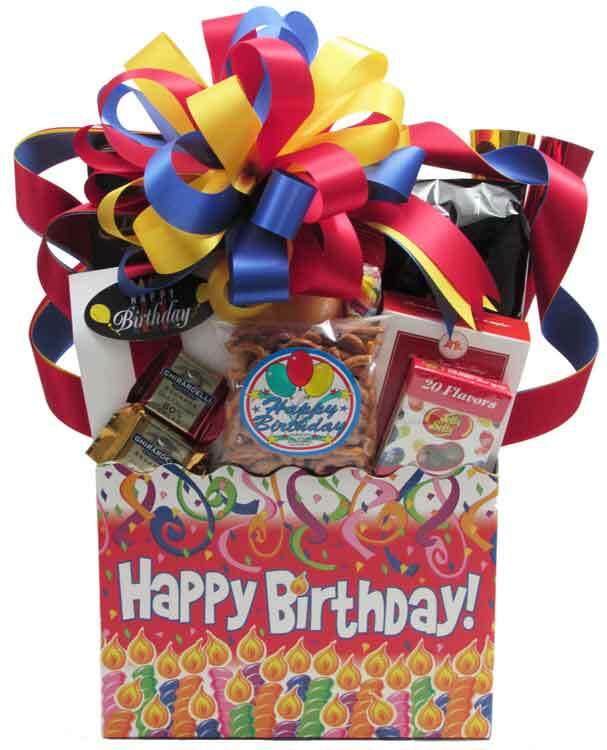 This "Happy Birthday" themed container with candles and confetti graphics, is the perfect Happy Birthday Gift! Wrapped in crisp clear cellophane and topped off with a beautiful "Happy Birthday" print Cellophane Fan and a big beautiful Handmade Bow. Includes a Handwritten Greeting Card. It's time to blow out the candles and party! 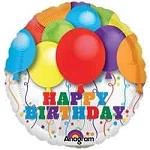 Add balloons for $2 each. LARGE: Filled full with Gourmet Jelly Belly Jelly Beans, "Happy Birthday" Raspberry filled Shortbread Cookies, "Happy Birthday" Snack Mix, Ghirardelli Chocolate Squares, Toblerone Chocolate Bar, Cheese Straws, Pound Cake, Nuts, Pretzel Twists (Smoky Barbecue, Salted Caramel or Cheese Pizza), Gourmet Popcorn (Cranberry Walnut Crunch, Almond Pecan Crunch, Dark Chocolate with Sea Salt Crunch, or Caramel & Jalapeno Crunch), a box of Peanut Brittle, and a Spiral Multi-Color Lollipop & a Metallic Party Horn, just for fun! Red, yellow and blue Bow. Finished wrapped design is approximately 22"H x 16"L x 7 1/2"D. THIS HAS BEEN A BEST SELLER FOR MANY YEARS! 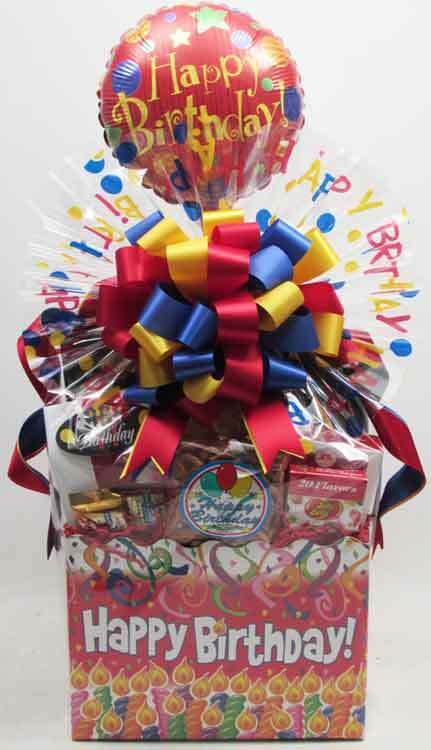 SMALL: Filled with "Happy Birthday" Snack Mix, Jelly Belly Jelly Beans, Nuts, Ghirardelli Chocolate Square, Cheese Straws, Pound Cake, Strawberry Banana Spiral Lollipop, Gourmet Popcorn (Almond Pecan Crunch, Cranberry Walnut Crunch, Dark Chocolate with Sea Salt Crunch, or Caramel & Jalapeno Crunch), and a tin of Chocolate filled Wafer Rolls! Finished wrapped design is approximately 17"H x 12"L x 5"D. Photo coming soon.